Portland Friends and family, I’d like you to think about something I find important socially and culturally, and also distressing. It seems that the world is changing and in many ways for the worse; those changes are happening in Portland as well. Perhaps what some consider “the new world order “is slowly taking effect here, but with those changes are coming to some horrible consequences that are going to divide this country. Unless social justice fighters and city leaders do something to maintain the idea and the practice of social equity for all, we will all see a new Portland being ushered onto the stage of our town. For the last several months I’ve been doing all I can to help people I know and people I come across when they need to locate a roommate so they can survive with a roof over their head. More and more people in Portland are losing their housing. There are families living in vehicles, being put under all kinds of stressors in their struggle to simply have a place they can call home, a roof over their heads, a place where they can stay warm and dry, away from the debilitating effects of the elements and the sickness and disease that come from living outside. There are women alone, who are being repeatedly sexually assaulted because they cannot find housing, or are being turned away from shelters that are filled to capacity, living alone and terrified of the dangers of the street. With my full-time work, as a real estate broker and my busy life, I’ve not been able to help as many folks as I’d like to, in their efforts to find housing or a roommate, but I’ve helped quite a few and I’m proud of that. But the most distressing thing I’ve noticed while interacting with these folks is that there has been a new development happening in Portland and it’s frightening, to say the least. A new phenomenon is happening in the Rose City. House-less folks, in their desperation, to find a place to rest their heads, most of them who are also working people are offering to rent out homeowners backyards! There’s a bidding war going on solely for spaces like this so that folks can pitch a tent and sleep outside! And landowners are taking advantage of it. They are taking advantage of the desperation of working people who cannot afford to rent an apartment in 2017 because with all the move-in fees they might need up to $3,000 or more dollars just to move in, let alone pay rent in Portland. I’m seeing people offer anywhere between $100 to as much as $600 per month for the opportunity to pitch a tent in someone’s wet backyard. For $600 a month they get to sleep outside in the wet cold, with no access to a kitchen, or even a toilet. If they’re lucky, they might get a landowner willing to allow an extension cord for electricity in their tent, so that they might be able to operate a small space heater, a hot plate or perhaps even a computer. Sometimes these folks ask for that extension cord out to the tent and access to a toilet, but it is certainly not assured. Many of these folks don’t even ask for that. How they are going to use a restroom in order to relieve themselves while they’re in their tent or near their tent I have no idea but think of how dehumanizing that would be! Can you? Can you even imagine the sense of hopelessness, the despair and the complete lack of dignity in having to live like that, and in being taken advantage of by property owners willing to do that? Is this what we want Portland to become known for? The bottom line is we’re seeing a frightening trend happening right in “keep it weird” Portland; a town known for its supposed activism, dedication to social equity and bigheartedness. Property owners are ready, willing and able to exercise a form of extreme economic power and control never seen before in Portland. They are offering little more than a patch of dirt for a struggling person or couple, or family with children and even infants to pitch a tent and live outside in the freezing cold for the price of what used to get a family of four a two bedroom apartment! Are you wondering why this matters? Are you wondering if this trend will impact you? Well, friends, as an expert in the housing and real estate market for nearly 35 years, I’ve learned a few things, and you should be thinking about it because the reality is, you’re only ONE paycheck away from living under a bridge, especially now in the harsh and uncaring climate we see in Portland, Oregon. What this trend shows with crystal clear clarity is that a person need not be the wealthiest person in the market to be able to compete against others, and use what little advantage they have to gain monetarily from someone else’s misfortune, bad luck or desperation. 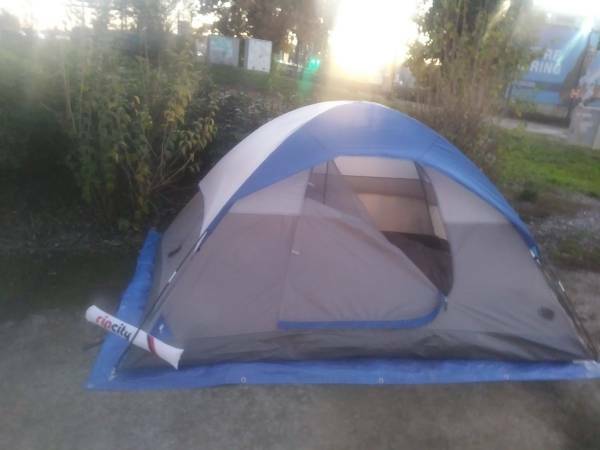 A person who makes just a little bit more money than the next guy can offer someone a spot to pitch a tent in their backyard. I’ve even heard of stories of folks renting houses who are renting out the backyards. That is the same reality we are seeing with our housing market when it comes to rentals. It comes down to supply and demand and what people are willing to pay simply for space to live. With 75% of new housing developments being constructed consisting of only luxury housing, where does that leave the Portlanders who’ve lived here their whole lives, who may also be low income? Where does that leave people of color, the elderly, or those disabled folks who live on a fixed income? But the end result is that this pattern I see will create a shifting set of values that will in time become acceptable. Renting out tiny houses, renting out backyards is the beginning of a social and cultural shift in this country where poverty is being normalized and acceptable. Do we want a city of two people? The poor living in tiny houses and tents, with the house living better, with heat, kitchens, bathrooms? Does Portland want to normalize the rise of elitism, by normalizing the kind of desperate poverty? Do we want a tale of two cities? From what I know, all Portland need is more HOUSING. And we have the money to develop it. We need more adequate housing for low-income folks. Not tiny houses, not tents in wet, cold backyards but actual HOUSING that is affordable and not inflated. But that means the leaders in Portland have to value these things and also acknowledge that there is something sinister happening in Portland. Its a slow insidious form of elitism and its impact will gain momentum if we don’t do something to stop it. when it could be averted? Email me with your thoughts, post a comment below or contact me via Facebook. I’m interested to know that you think.